FOLLOWING the announcement yesterdaythat Yorkshire Water are to put in place a £50,000 Community Fund we have received some questions about the way forward. In conjunction with Ray Duff from the Hedon Blog we will try and keep you up to date with progress. A meeting at the Waste Water Treatment Works (which is not a public meeting) takes place on Monday 30th April 2012 to discuss the criteria for the new fund. This meeting will discuss the terms of reference and appraisal procedure for applications to the new fund – as well as discussing how to advertise and promote the fund to potential bidders. You will notice that there was no representative from Paull at this meeting. The exact reason for this is not clear but Mike Bryan and Ann Suggitt (East riding Elected Councillors) are looking into this matter and we will let you know the answer as soon as we have more information. Several of you will know Ray Duff who not only edits the Hedon Blog but helps at our Computer Club each Friday. He has been invited to the meeting representing the Hedon Blog. He has discussed this with a member of the Community Engagement Team at Yorkshire Water and he feels the Blog has a role to play in helping to promote the new Community Fund and encouraging applications. We will pass on further information as soon as we have it. The Rt. Hon. Danny Alexander MP, Chief Secretary to the Treasury, was the guest speaker at the launch of the new Humber Local Enterprise Partnership (LEP) Forum held in Willerby, Hull, this morning. He also confirmed the government’s commitment and support to ensuring that renewable energy plays a greater role in the UK’s energy mix, and said that the Humber had a leading role to play in the sector. “The Humber has the potential to establish itself as a world class renewable energy hub. This will help attract companies that can benefit from simplified planning processes, superfast broadband, and tax breaks funded by the Treasury, including discounted business rates, and enhanced capital allowances on plant and machinery. “The Humber Renewable Energy Super Cluster Enterprise Zone is one of only six in the country able to offer companies enhanced capital allowances on plant and machinery. These allowances are worth as much as £100m to new companies locating in the area, and for businesses not receiving these allowances, business rate discounts for five years can amount to as much as £55,000 per year. English Heritage is working with the owner of Paull Holme Tower to explore sustainable uses to secure the future of the monument. We have been in very positive discussions with the owner and have offered a grant of £27,000 towards the production of a costed condition survey, feasibility study and options appraisal for the site as well as providing some temporary repairs to the building to secure it in the short term. We have worked with the owner to ensure his grant application meets our funding requirements and conditions one of which requires that the grantee should use a suitably qualified professional adviser – either a conservation accredited architect or Chartered Surveyor and they should have been appointed following a competitive tendering process. 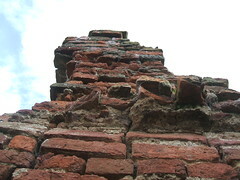 English Heritage would not be able to provide grant aid under European rules on any other such basis. It was also felt that all options should be looked at for a future use of the building in order to give the owner a fully informed and considered approach which might be more beneficial to both the owner and monument itself. It is on this basis which we have offered our current grant. We have discussed with the owner over a number of years the management of vegetation on the monument. Addressing how to undertake this aspect of managing the monument will form part of the current grant application. Paull Holme Tower – Heritage disappearing in front of our very eyes! 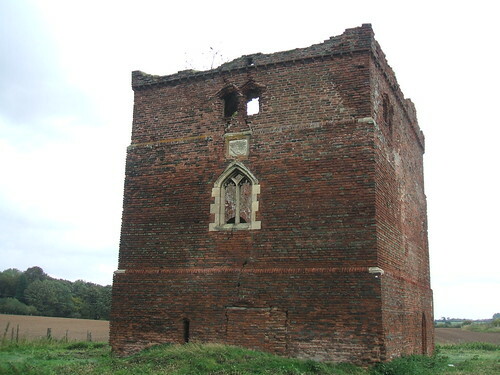 PAULL HOLME TOWER is a 15th Century three storey brick tower between Paull and Thorngumbald and was once part of a grand manor house and moated-complex and is a Grade I listed monument. The Tower is believed to be located at the centre of the original settlement of Paull – and buildings may have been on this site dating back to before the Domesday Book! The Tower was open to the public for the first time as part of the Heritage Open Days weekend on 10th and 11th September 2011. This was made possible due to English Heritage agreeing to cover the public liability costs of opening the monument. Simon Taylor, the owner of the tower, was on hand to meet and talk to dozens of enthusiastic visitors to the site. And the deterioration showed! Crumbling brickwork and erosion by weather and plants was clear for all to see! But this ‘loss of fabric’ represents history and heritage disappearing in front of our very eyes! Simon Taylor says that he bought the Tower nearly 25 years ago in order to “save it” and that job continues. He hopes that renewed interest in the site through the Open Days will encourage people to get involved in helping to form a trust or not-for-profit body that can look at preserving the ancient building. 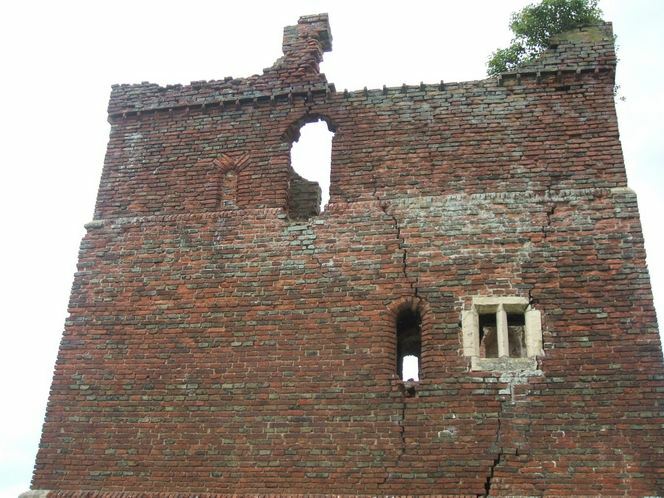 If anyone can help with this task then they can contact simon@stonecreekhouse.co.uk – and if you visit the site, then leave your opinions on the Heritage Open Day’s Paull Holme Tower website. Seaside FM interviewed Simon during roving reporter Paula Coomberg’s visit to the site – the video also reveals the current state of this fascinating building. If you would like to see this interview, which includes film of inside the tower please click here I am afraid the quality is not brilliant but it does give an insight into the problems of the site. It is part of our Heritage and should be saved. So if you can help please contact Simon on his email shown above. HUMBERSIDE POLICE OFFICERS have recovered a large amount of garden and allotment related tools and equipment following the arrest of a 48-year-old man in Scarborough. The find comes after investigations into the recent spate of thefts from allotments in Bridlington, Pocklington, Goole and Hedon. Following the discovery, detectives investigating the incident are inviting victims of the thefts to attend at Goole Police Station on Thursday 01 September 2011 between 2pm and 6pm to see if they can identify any of the recovered property as theirs. Anyone wishing to come and view the property is asked to contacted David Cooke, Goole CID on 0845 60 60 222. Local Ward Councillors, Cllr Mike Bryan and Cllr John Dennis, determined to bring an end to the dreadful odour problems caused by the Waste Water Treatment Works at Saltend, have brought Yorkshire Water, Graham Stuart MP and East Riding of Yorkshire Council officials together to get matters sorted once and for all. At the meeting which took place on Friday 5th August 2011 in Beverley Councillors took Yorkshire Water to task demanding they make themselves available in Hedon at a drop-in within the very near future to give local residents the opportunity to air their views and concerns. They have also requested Yorkshire Water provide a long term plan on how they will manage their process more efficiently in the future. Portfolio Holder for Public Protection, Councillor Jane Evison, who also attended the meeting said she would be ramping up the scrutiny and would ensure an increased level of supervision from the East Riding Of Yorkshire Council would take place in the future. All three Ward Councillors, Mike Bryan, John Dennis and Independent Ann Suggit, have now made their positions on the Yorkshire Water Smells perfectly clear: Enough is Enough! It is hoped that more details from the meeting, particularly the suggestion of a Hedon Yorkshire Water “drop-in”, will emerge in time for the first meeting of the new campaign Organising Group on Tuesday. Only months after HOTI successfully fought off the plans to build a waste burning incinerator we now face a new fight – against the foul-smelling stink from Yorkshire Water’s lamella tanks at its Waste Water Treatment Works. The smells – which Yorkshire Water told us in 2000 would not exist – have ruined local residents enjoyment of the summer weeks. And there is reason to believe that the health of some residents have been adversely affected by the most penetrating of odours. Yorkshire Water has apologised for the odours and claim that things will improve when the new £3.5m odour control unit is built – but they seem to be unable to tell us that smells will be eliminated. The Readers of the Paull Village Hall Website and The Hedon Blog have responded to the concerns of its readers and commentators by launching a petition that urges East Riding and Hull City Councils to treat Yorkshire Water and its smells as a public nuisance and use the legal system to force the company to eliminate its odours or suffer the consequences for its ‘criminal’ acts. To Sign and Share our petition click on Yorkshire Water Smells – Petition. BP CHEMICALS has been fined £30,000 at Hull Magistrates Court after pleading guilty to a leak of Syngas containing carbon monoxide from its plant at Saltend in 2009. Between 10th November and 11th December 2009, a total of 572 tonnes of combustible Syngas was released into the atmosphere from BP’s Saltend chemical works when a valve failed. But the Magistrates Court, which met last Friday 22nd July, heard that there were no alarms or procedures in place to detect the release. This resulted in a lengthy period before the leak was discovered. The release of gases consisted of 324 tonnes of carbon monoxide, 175 tonnes of carbon dioxide, eight tonnes of methane and 65 tonnes of hydrogen. The combination of these gases which make up Syngas have the potential to be highly flammable. The leak was only discovered on the 7th December when a technician attempted to take a sample from a ‘cooling water return line’, and his personal carbon monoxide alarm was activated. BP said this was a single incident and there was no breach of air quality standard for carbon monoxide. No harm was caused to employees or members of the public, and that environmental impact was minimal. The chemicals giant also made changes at the plant to prevent this from happening again. BP was also ordered to pay court costs of £5,220 to the Environment Agency, which brought the case. ADMIRAL LORD GEORGE ANSON was Member of Parliament for Hedon from 1744 – 1747. He is, perhaps, the most famous person ever to have held the position of Hedon MP. In 1740, during war with Spain, Commodore George Anson led a naval expedition to disrupt Spanish possessions in the South-Seas. He returned four years later in 1744 via China to complete a circumnavigation of the world. 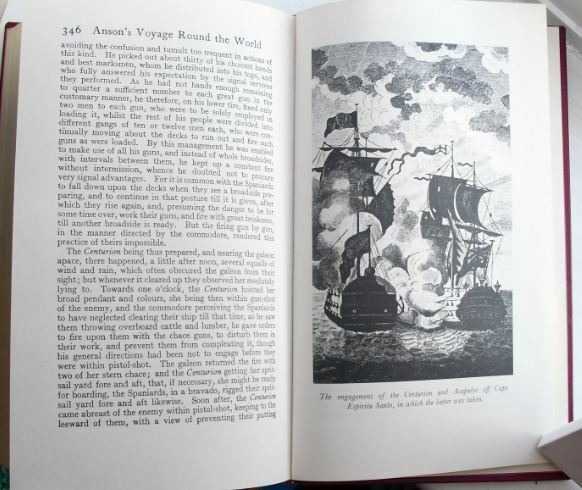 The book of his journey A Voyage Round the World written in 1748 is a remarkable account. It contained a huge amount of useful information for future navigators and with 42 detailed charts and drawings it laid the basis for later expeditions by Captain Cook. But more than that, it is a professional account of seafaring adventures, naval warfare, of disease, wrecks, mutiny, treasure – and disasters, particularly disasters! Of the original 1,854 men that set sail from England, only 188 survived. The book also changed the popular depiction at the time of naval officers as ferocious individuals with “a turn of mind and temper resembling the boisterous elements they had to deal with”. Anson was keen to promote seamanship, science and art as essential to a ship officers’ development. Anson used his great influence and wealth to ‘acquire’ his Hedon parliamentary seat in the days when the influence of a patron determined who ‘won’ elections in the borough. It is not known if he ever visited Hedon during his term as its MP. Anson continued his naval career with distinction, joining the Admiralty Board in 1744, then becoming First Lord of the Admiralty from 1751 to 1756, and again from June 1757 until his death in 1762. Lots of places bear Anson’s name across the world, including Anson Villas in Paull, and seven British warships have been named HMS Anson. YESTERDAY THE GOVERNMENT ANNOUNCED that it had received 29 bids for ten Enterprise Zones it will support to bring economic growth and jobs to specific areas. The Humber Enterprise Zone is one of these bidding for funding and is described as the Humber Renewable Energy Super Cluster and is believed to cover 10 potential development sites in Hull as well as area on the South bank of the Humber. The 10 Hull sites under consideration include the potential site for the Siemens wind turbine factory, but – according to the Hull Daily Mail – also includes “a largely undeveloped 49-hectare site at Paull east of Saltend”. 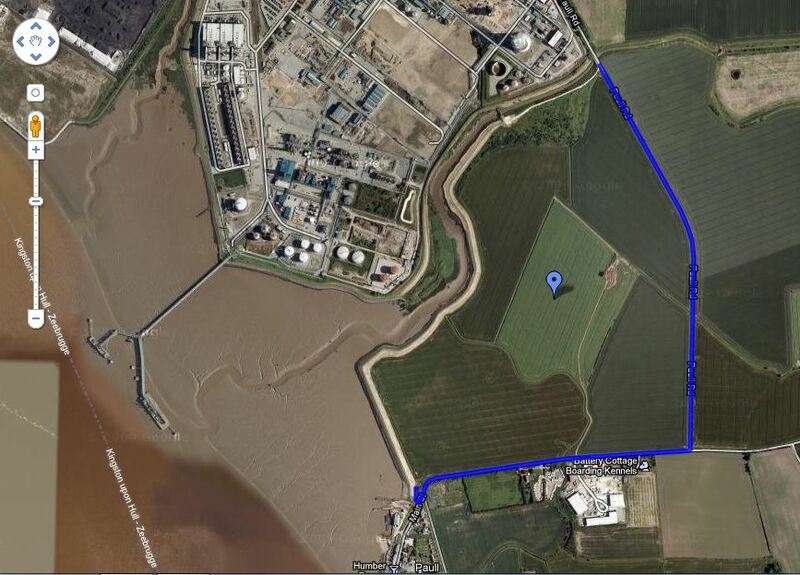 The Google map image below shows the area under consideration with Paull at the Southern tip of the blue line (which indicates the road bordering the development site). The site is currently used for growing crops and is bordered by a popular riverside walk connecting the village to Saltend / Hedon. Whilst the argument for jobs and economic development is a strong one – the affects on Paull of such large-scale development on its doorstep needs to be carefully considered. Under a new collection service to be introduced by the East Riding Council. East Riding of Yorkshire Council is launching its latest kerbside collection which will allow residents to put glass, a wider range of plastics and Tetra Pak in their blue bins. service to up to 150,000 households across the area. surrounding villages, from 27th June to the 22nd July. It is projected that an additional 3,800 tonnes of glass will be taken out of landfill. As part of the new service, the council is offering residents the choice of a larger, 240 litre blue bin in exchange for the smaller one that most households currently have. Residents are urged not to put glass, further ranges of plastics and Tetra Paks into their blue bins until they receive a letter from the council informing them of the start of the scheme in their area. THE “SALTEND SMELL” – a term which probably unfairly attributes the odours emanating from the Yorkshire Water Waste Water Treatment Works on Hedon Road to the hamlet of Salt End in Preston Parish – is under the spotlight once again. 24 odour complaints have been received and recorded by Yorkshire Water or the East Riding Council between 28th March and the 1st May 2011. Additionally the odours became an issue in the local elections, with most of the candidates referring to the odours in their leaflets and statements. However, Yorkshire Water is keen to demonstrate to local residents its efforts to reduce odours from the Treatment Works. They have organised a series of seven presentations about the site over the weekend of Saturday 21st May – Sunday 22nd May, each followed by a tour of the Treatment Works. The events are aimed to disclose to residents the work that goes on at the site. In particular they want residents to find out more about the £3.2m construction of a new odour-control unit. Local residents should have received a letter explaining how to book a place on one of the presentations and tours (note the tour is not suitable for those in wheelchairs or for those under 16 years of age). PLANS TO DEVELOP WIND FARMS off the East Yorkshire coast were first announced by the Government’s Crown Estate in January 2010. Those plans took a step closer last week with the announcement of consultation events on the first part of the project planning. A consultation event open to all members of the public will take place at the Hedon Methodist Church on Friday 15th April 2011, from 2pm – 8pm. SMart Wind Ltd, the consortium behind the wind farm developments, intend construction to begin by 2014. The Statement of Community Consultation is available from the SMart Wind website. With effect from 10th February 2011 the current Churchyard has officially closed. An application was made to Her Majesties Court stating that no suitable places were left for future burials. Burials will still be allowed in family graves which are already in existence and allocated for two people. The ashes plot is closed. A new piece of land to the east end of the Church has been acquired by Paull Parish Council for any future burials within the Parish. The Parish Council has drawn up a set of rules and charges for burials in the new Churchyard and should you require a copy then this can be obtained from the Parish Clerk, Mrs Dianne Davies. EAST RIDING Council’s Walking for Health Scheme has announced new walks in Paull. EAST RIDING OF YORKSHIRE COUNCIL has placed itself in a stronger position than many other local authorities by anticipating and planning carefully for funding reductions before they were announced by the Government in December. Thanks to this planning, which began in 2009/10, the council has been able to set a budget today which protects essential services and freezes council tax at the same level as the current year. The massive funding reductions for the public sector – which come as the Government seeks to cut the national deficit – are having the impact we expected on local government.Our forward planning and early action have helped us to mitigate the effects of grant reductions. This means we can avoid unplanned cuts and knee-jerk reactions even though the East Riding has had a reduction in Government funding of £30m over the next four years. The budget which has been set today protects key services and continues to fund the priorities which have been agreed with our partners and residents.Council tax has been frozen for 2011/12 at the same level as the current year and the council’s popular free parking on Saturdays and Sundays in December has been extended from 1 November to 31 January to further help residents and businesses in these difficult times. The council approved savings totalling £9.5m, which will be achieved through projects which include improving productivity and reviewing service delivery, looking at the use of council premises, improving procurement of goods and services and reductions in expenditure. There are no proposals within the savings to close any of the council’s leisure centres, libraries or other facilities. Following a public consultation undertaken earlier in the year which identified highway maintenance, support to vulnerable adults and children as key priority areas, an extra £4.6m is being spent on adult social care to meet the cost of caring for the elderly and people with disabilities and an additional £491,000 has been agreed to protect children at risk and the increasing number of children requiring local authority care. Additional funding has been made within the budget for highways maintenance and a further £2m has been released from contingency funds to provide additional salt and fast-track repairs to the highway caused by the severe weather experienced in December. Recognising the importance of transport in a rural area funding for supported bus routes has been maintained . Following successful working with town and parish council’s to clear the snow in December a total of £200,000 has been allocated through the Local Strategic Partnership for town and parish councils to spend on local communities and projects. Blue bins will be able to be used for glass and household batteries. The changes to the Brown bin collection service will start in Hedon first, although residents are asked to wait until they recieve information from the Council before they start adding any new items to any bins. The Management Committee of Paull Village Hall have announced that they have agreed a deal for an ‘After School Club’ to begin the the Village Hall every Thursday afternoon from 3.30pm to 5.00pm beginning Thursday 19th May 2011 until the end of the school term in July 2011. They offer Snug Portable Play, funky arts and crafts, team games, face painting, den building, parachute games and plenty more! The club is FREE to the children as the scheme is funded by the Big Lottery. To read more about ‘Play Action’ CLICK HERE This is a wonderful opportunity for the younger children in the Village and I hope everyone will do all they can to support it. EAST YORKSHIRE MOTOR SERVICES announced last week that most of its bus fares will rise from Saturday 22 January. The cost of a single fare from Hedon to Hull will rise by 15p to £2.00 and a return fare will rise by 30p to £3.60. The company is also promoting its Discount Cards and states that 10% can be saved on all single and return fares. The card itself is free and they’re available to everyone – you can apply online at the EYMS Website.